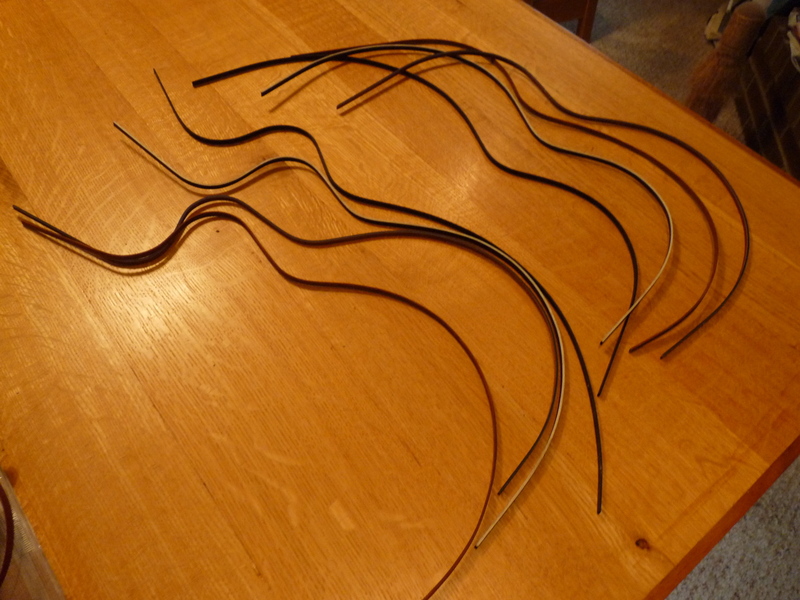 One of the skills that has never given me any trouble in my luthiery odyssey has been hot pipe bending. The only time I had any problems, was with using stock that was too thin and had a lot of runout. Bending bindings, especially, seemed a piece of cake; even curly maple, which is reputed to be a bear. So when I decided on the bindings for the current two builds, I didn’t give it much thought. The client specified cocobolo for his, and I decided on ebony for mine, being a nice accent to the myrtle. I got the binding stock and chugged along on the build. I was a little nervous about the added bends around the cutaway, but that just means two extra curves. When it got time to bend the binding, I fired up my pipe and prepared my wet cloth and spray bottle. (I have been using a new technique after seeing famed Luthier Flip Scipio wrap his hot pipe with a wet cloth to provide constant steam. It really works.) 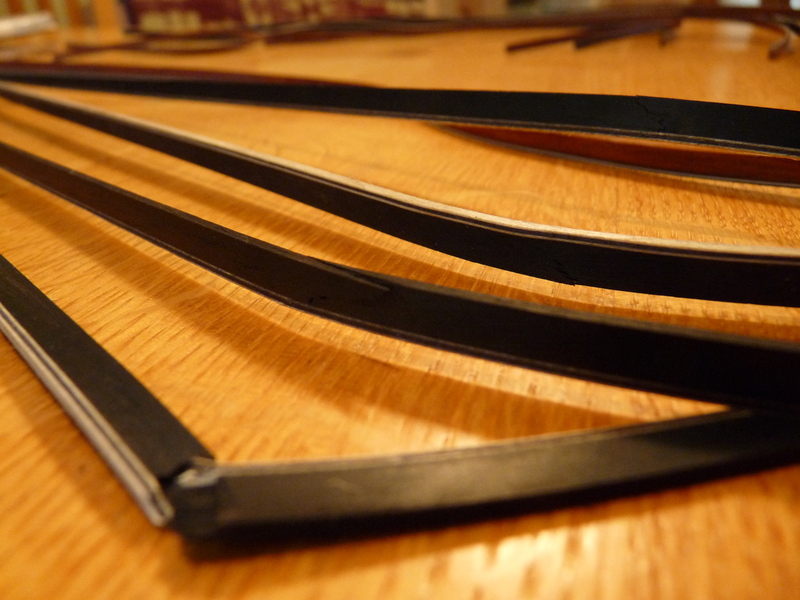 I started with one of my ebony bindings, and everything went nicely, it bent like butta! I got that one in the mold to dry and started in on the next one. No sooner had I started then I could see a split starting to open up. Sigh! I grabbed another one and…ARGGH! The same thing happened. I tried the cocobolo and got a couple of sides bent, but the third one decided to join it’s fractured ebony brethren. I took that as a sign and shut everything down. When I got back to it, after a couple of days, I managed to get one more cocobolo bent, but the remaining ebony blank also began to split almost immediately. I was done. Unfortunately, I hadn’t ordered any extra (that stuff adds up, ya know!) I knew I would be going up to the Athens area in the next week or so (which actually turned into a month, plus), and I would get more then, this time getting some extra. When I finally got the replacement blanks (with some extra! ), I went back to the bending iron. I was able to get the rest of the ebony sides bent with only one breakage (and that one just snapped completely), and the final cocobolo side. With the ebony, if it was going to break, at least it did it on the first bend. Otherwise, it bent beautifully. (The one cocobolo that broke I think did it in sympathy with the ebony.) I may have to do a little touch up bends, but essentially done and dusted! Now I know to charge accordingly for any future builds, not just for the expense of the wood, but to cover the inevitable breaks and the extra blanks needed. Just make sure there are no children around when your trying to bend ebony, otherwise you’ll surely need to be bound, and gagged! This entry was posted on September 26, 2012 at 6:41 pm and is filed under Acorn House. You can follow any responses to this entry through the RSS 2.0 feed. You can leave a response, or trackback from your own site.